I tried to sell a dining room table and chairs on craigslist. I went through the annoying process of having my merchandise vetted by the kind of highly particular and discerning consumer who somehow manages to forget that he or she is paying bottom dollar. I decided to give it another try, with a fresh ad. This time I provided a better description of the set, and also fully disclosed the imperfect condition of the upholstery while (I hope) eliminating or at least lowering the chances of another non-productive, highly annoying e-mail exchange. I found the end result somewhat abrasive, but so be it. Somebody needs to burst the bubble of overoptimistic craigslist shoppers. Okay, this is not the first time I’ve posted an ad for this dining room table with chairs. I think I wasn’t clear the first time. The table is beautiful. And no, it’s not scratched. This is tempered glass, half an inch thick. You kind of have to use tempered glass for a table, or you’re one mishap away from a grisly scene like Sam Peckinpah would film. I suppose you could scratch this table with a diamond, but we haven’t. It is in perfect condition. And around the edge of the glass is a nice bevel that I have enjoyed gazing upon over the years, along with my kids who by age six were using phrases like “refractive index” all because of the IQ-increasing visual effect of that beveled edge. 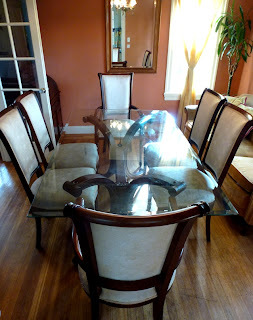 The workmanship on the chairs is excellent and they are free from nicks and scratches. Is the cream-colored fabric pristine? Honestly, it is not. I neglected to mention this in my original ad because I actually had not noticed. Why not? Because the armchair I always sat in, at the head of the table, is pristine. The rest of the chairs have always either had somebody sitting in them or were pushed in. So really, stains on the seat are not that noticeable. “Aha!” you might be thinking. “It’s a glass table! So you’d see the stains right through it!” False. This was our family dining table. Every family uses their dining table as a clearing house for books, papers, crafts, and as a general storage area for anything that needs to be handy. If you don’t agree with this statement, you are lying to yourself. Moreover, what do you expect for $250? A gorgeous perfect-condition tempered glass table with six chairs all in perfect condition? Should it come with a couple of guest passes for spa treatments at Indian Springs as well? What about an unconditional lifetime guarantee? I am imagining the future owners of this dining set to be a young couple, perhaps in a starter home, who are either planning to have kids or already have a baby, maybe a toddler, who will graduate from a highchair soon. That would explain the price point. (If you live alone or are part of a couple not intending to have children, perhaps you should just wait until you have enough money for a decent dining set that IS spotless.) So, assuming you do intend this as a family dining table, trust me: immaculate upholstery is the last thing you should worry about. Do not even ask if I’ll sell the table without the chairs. Someone already asked me that. First of all, it’s an absurd notion: what am I going to do with six chairs, five of which are stained? Who would want them? I guess I could lower the price by fifty bucks and put the chairs on the curb for the garbage pickup, but I’m trying to raise my kids not to be grossly wasteful like that. Besides, where are you going to find six pristine dining chairs for fifty bucks that are going to match this table? Moreover, I found that question insulting. These chairs have been good enough for me for twelve years—but they’re not good enough for the person with the $250 dining set budget? So go ahead, scrutinize these photos, be as critical as you want, but don’t forget that your limited budget doesn’t realistically entitle you to expect a table and chair of this high quality that has the useless short-term idiosyncrasy of unblemished upholstery. Oh, maybe you’ll find something out there, like a waxy, silly-putty-colored table made of recycled milk jugs with chairs that either have a vomit-colored fabric that hides any stain but looks awful to begin with, or cream-colored fabric treated with some miracle coating that will look great but that, ten years from now, they’ll discover is totally toxic and has damaged your children in ways you can’t even bear to contemplate. If the cost to you of denying the inevitability of stained fabric is that high, maybe you’re better off with a cut-rate illusion-of-quality dining set. But just remember: I had this table for twelve years and the fabric never bothered me. My memories will always be of the times when the table had been cleared of papers and projects and I could gaze upon its glass-topped beauty with pleasure—the kind of aesthetic experience that causes a little sigh of pure bliss. Around this table I have entertained people who are either heads of state or deserve to be. I have carved magnificent turkeys at this table and it did them justice. My kids have snacked while reading library books (normally forbidden at table due to the spill risk) by holding the book with their knees under the glass—just try that with a table made of reconstituted chicken guano or whatever that horrible cheap furniture is made of. One more note: just in case you’re worried about the “human” factor, fear not: we have steam-cleaned these chairs (after I took the photos, by the way, though as I’ve said the aesthetic aspect of chair seats is irrelevant). So you won’t be getting our cooties or anything. And no, there are no blood stains, no red wine stains (which I’ll concede would be really squalid), no cigarette burns, and nothing that’s going to soil anybody’s pants. It’s good, honest dirt and it’s not going anywhere. So do yourself a favor: step up to a level of luxury that, at this price point, is only possible in America and through my own sentimental largesse. In the process you’ll be sheltering your children, present or future, from any unfair castigation for soiling these chairs, because that inevitable process has already been taken care of for you. If, on the other hand, you’re a totally unrealistic person with an all-consuming fetish for blemish-free textiles, please do not respond at all. I don’t want to be talked down on price or presented with any insane notions like splitting up the set. Just go about your endless search for the perfect $250 dining set that looks like it was never even used. Good luck with that. A friend responded to my ad, “I see, it’s like the Nigerian Prince scam, which is purposefully unbelievable so that it filters out everyone but the extremely gullible. In this case, though, you’re filtering out those somewhat interested individuals who would just waste your time. Clever.” Indeed, this was my intent with the ad, but my filter wasn’t selective enough. I had three people e-mail me saying they wanted the table, but not one of them actually came through. I made the mistake of giving the first respondent plenty of time to come pick it up, which I think poisoned the well for the other two. I finally sold the set to a friend. I think maybe I’m done with Craigslist.